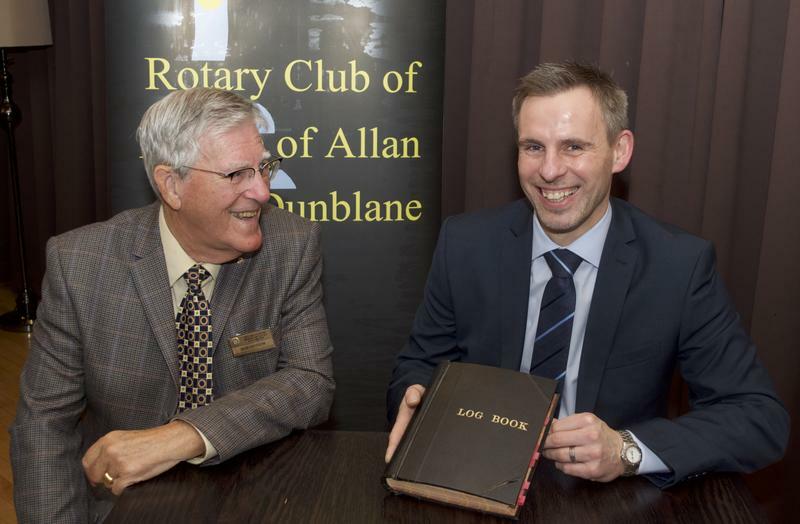 Education is a matter of enduring interest, so it was a pleasure for the Club to welcome Stuart MacKay, Head Teacher of Dunblane High School, to talk about the work of the School and the many issues facing education. Stuart has been the High School’s Head Teacher for three years, following previous appointments in Wallace High School and Balfron High School. The school, he reported, is in good heart with currently 933 pupils, 91 teaching staff and a strong team of support staff. Perhaps surprisingly, although only 29 pupils are eligible for free school meals – an obvious indicator of the relative affluence of the catchment area – some 233 pupils have been identified as having need of some form of particular educational support. Looking more broadly, Stuart referred to the Scottish Government’s initiative to ensure that those living in areas of deprivation have the same opportunities for progression as those from more affluent areas. The amount of grant specifically provided for this purpose can be significant, with, for example, £354,000 received by a school in a deprived area of Glasgow compared with the £10,800 received by Dunblane High School. For all schools, Stuart insisted, an important consideration is ensuring that pupils are supported in an appropriate way so that, whatever their abilities, they are encouraged in their progress to employment. For the High School, whose exam results place it as the ninth highest achieving school in Scotland, some 67 per cent currently progress to university, with a further 20 percent taking vocational courses in further education. But, crucially, it is important to match the student’s aspirations to an appropriate route that may not necessarily involve university: many vocational openings, including modern apprenticeships, may offer a better match of career route. To this end, the School has embraced the Developing Young Workforce programme with all pupils in their fifth year having a week’s placement in an employment environment. The School’s Improvement Plan has as its main emphases issues of attainment, disadvantage, health and employability. In promoting these areas, the School works collaboratively with other schools in the area, as it does also with various community initiatives, including those run by the Dunblane Development Trust. Stuart also praised the support given by the Rotary Club which has involved the School in the Euroscola and other Rotary initiatives. Support from this source and by the Parent Council is, he said, very much valued. Inevitably, there were many questions from members raising issues such as the use in schools of smartphones and access to social media, as well as the School’s use of computer-supported learning. Bob Watson, Speaker’s Host, joked with Stuart that his talk had dispelled for him long-held prejudice against head teachers whom, in his past, he had associated with punishment. Members, he said, had been educated and entertained, for which he thanked Stuart.